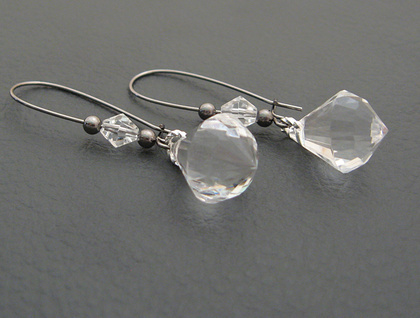 Multifaceted acrylic drops glitter like huge, fat diamonds, beneath elegantly arched ear-wires. 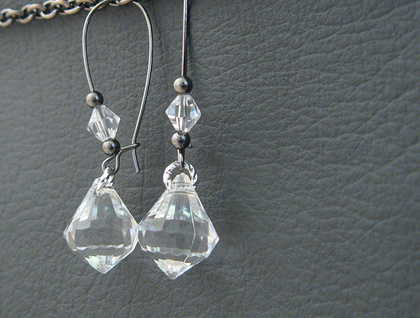 Above each drop, accenting the ear wire, two small, smooth, gunmetal black beads flank a clear crystal bead. 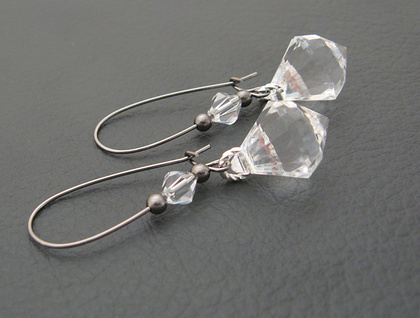 The faceted drops are made of lucite, which is a type of acrylic. They are lightweight but sturdy, and their shape is like a cross between a diamond, a pear, and a teardrop. The crystals are semi hand-cut, so their facets are not perfectly precise. Their sparkle beautifully complements the large acrylic drops. 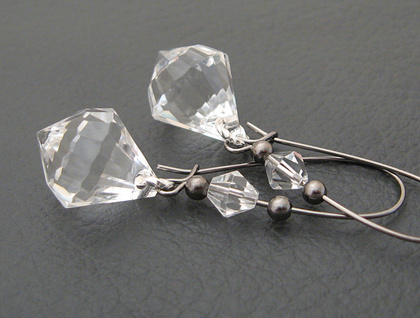 The earrings measure 51mm from top to bottom. The lucite drops are 19mm long, not including the silver-plated, twisted rings that attach them to the ear wires, and 14mm wide. The beads and crystals have been simply slid onto the ear-wires, so it is recommended that you keep the ear-wires closed so that the beads do not slip off and get lost. Keeping the earrings hanging, rather than jumbled up in a jewellery box, will help to ensure that the ear-wires do not get opened or bent by other jewellery pieces pushing against them.